Whether you’re just getting into keeping hamsters or you need a new habitat for your furry friend, chances are you’re going to need a new cage. Our hamster cage buying guide can help with that! We took a look at a lot of different cage designs and products in order to bring you the best of the best that’s available right now! But before we get started, here are some things you should know. Material: What is the cage made of? Most of them are made of plastic or wire, or some combination of both. These are the sturdiest materials and also the easiest to clean when the cage gets dirty. Pieces: This refers to how much stuff comes with the cage. Most of the cages on this list come with extra toys and accessories, as well as food dishes and water bottles. So how much will you have to buy separately? Levels: How tall is the cage, and how many different levels are there for your hamster to enjoy? Some cages come with more than one platforms that your furry friend can play on, great for hamsters that like that! Chew Proof: Sometimes the wire or plastic that makes up the sides and roof of a cage will be coated in order to prevent the hamster, mouse, or gerbil from being able to chew their way out of the cage. Size: It’s important to know how big the cage is because you need to know where you’re going to set it in your home. A larger cage is going to be harder to clean but may hold more than one. 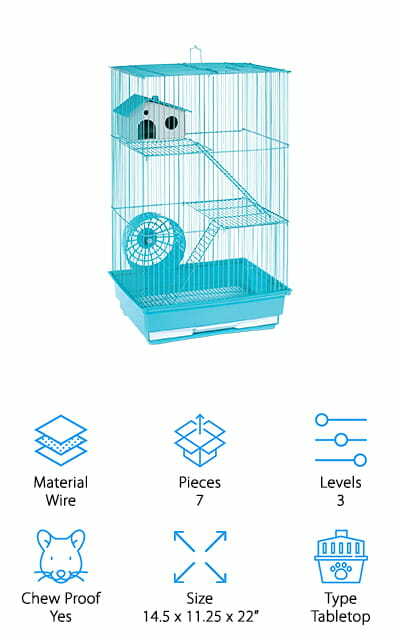 Type: Most of the cages on our list are either modular cages that can be connected and moved around without incident or tabletop cages that are meant to sit there on your table and keep your pets happy. Now that you’ve learned all there is to know about hamster cages, we can get to the hamster cage reviews! These products were hand-selected from scores of similar products because they all have something special or unique. Our top pick and budget pick are obviously our best choices, but the rest of the list is full of amazing cages as well! Take your time to make a choice, because your furry friend deserves it. The best hamster cage for sale that we could find is this Ferplast option. It’s a modular cage, which means that it’s meant to be attached to other toys and habitats. There’s a cap fastened near the back of the cage where you could easily attach a tunnel and enlarge your hamsters’ play area. It’s also split-level, so upstairs there’s space for the water bottle and feeding on a wire floor, while the bottom level can be filled with shavings for your hamster to play in and nest in. Between the levels, a hamster wheel is suspended, giving your pet plenty of playtime. It comes with everything shown in the picture, so you don’t have to buy additional supplies. We love the idea of a multi-level hamster cage that gives your pet so much more room to play without taking up a whole lot of tabletop space. Your hamster will love their new space to nest and play! 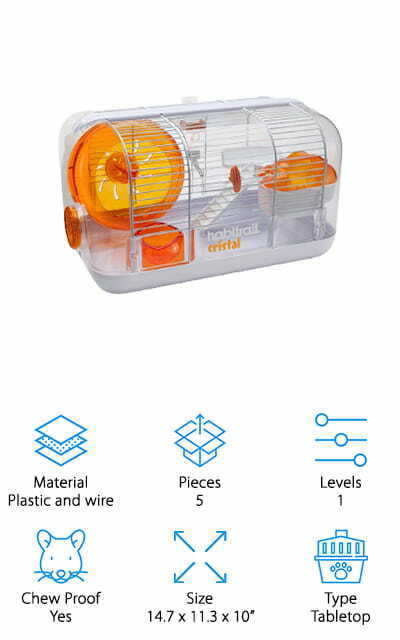 This wire hamster cage by Habitrail is a great value for everything that you get with it! You won’t have to purchase any extra accessories because for this low price you get a food dish, litter guard, water bottle, exercise wheel, and a deck with a ladder for your small furry friend. It also just looks cool, instead of being a plain wire cage – it’s all in white and orange, which is a nice touch especially for younger pet owners. It’s also an easy clean hamster cage, as you can take every part of it apart to clean it as quickly as you need to, without too much hassle. All of the accessories, including the wheel, will keep your hamster healthy and entertained. And the water bottle that comes with the cage is chew-proof as well, with a stainless steel tip! Using lock connectors from the company, you can even connect it to other habitats and play areas! This habitat by IRIS is actually one of the best dwarf hamster cages on our list. It’s a little on the smaller side, but that just means that your dwarf hamsters will think it’s cozy! There are three levels to this cage, and your pet can climb up to them via the small ladders that allow them to explore their world. 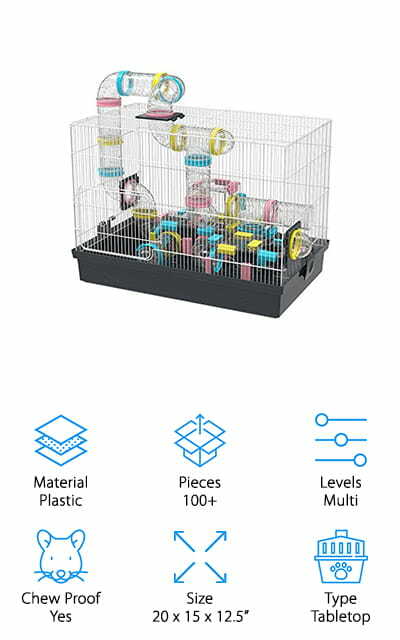 This cage conveniently comes with a water bottle that it’s chew-proof, a food dish, and a wheel that your hamster will love to exercise on. 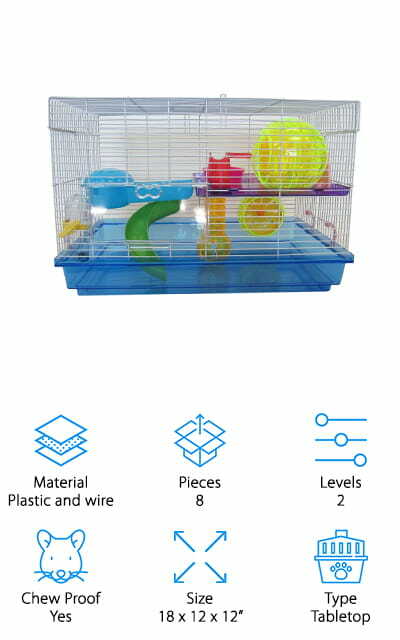 It’s a great cage for a younger pet owner, or perhaps one that is just starting out with hamsters or other small mammals. Just fill the bottom level with litter shavings and your small pet will be comfortable and happy! It also comes in a few different colors, so you can customize your space. The sides are wire to promote breathability and comfort in your pets’ new favorite home. This extra-large hamster cage by Kaytee is colorful and perfect for your furry friends! This habitat is the starting point for a whole world of hamster fun because you can connect it to both other habitats and play areas to allow your pets to roam, socialize, and stretch their legs. There are so many tunnels and spaces that you can connect together, your pet is sure to love it! 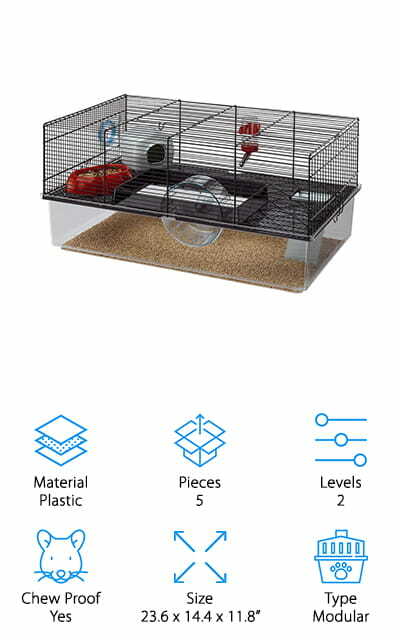 It comes with a food dish, water bottle with chew-proof tip, and an exercise wheel, as well as a petting zone platform where you can interact with your hamster without taking it out of the cage. There are two levels of space here, and it’s large enough that your critters are going to feel right at home and happy! Compared to the other cages that we looked at, it’s also a tall hamster cage. You can use it for gerbils or mice as well; they’ll love it too! Rosewood Pet makes this cute home, a nice but cheap hamster cage that will delight your pet. There are an incredible four different levels of platforms and ramps for them to play on. They’re going to get plenty of exercise running around all the space that they have. 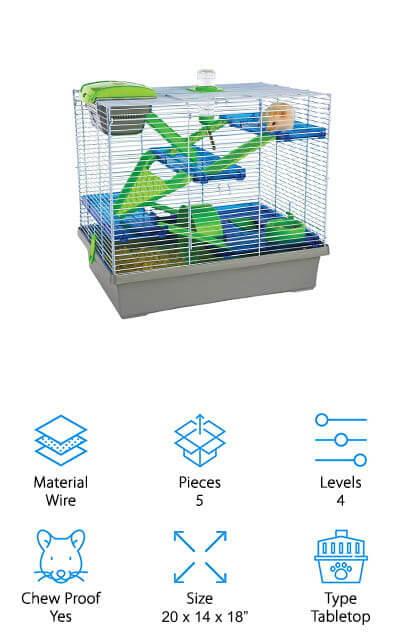 It’s made of high-quality wire with plastic pieces, and the bars are spaced just far enough apart that your hamster can’t squeeze out between the bars. 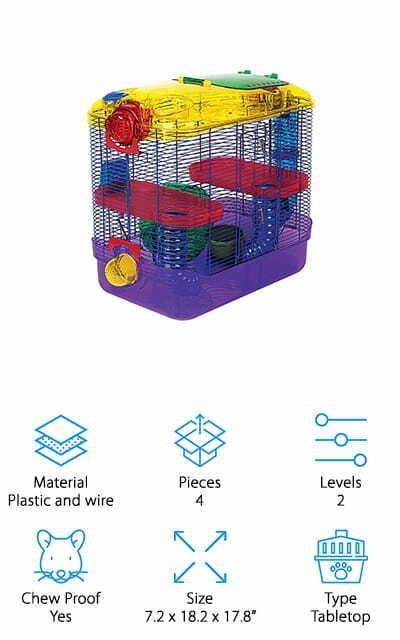 What we liked most about this cage, other than the bright colors of the accessories, is the fact that the bed at the top of the cage has a compartment that opens up right into it, so you can always get your hamster out if they are hiding in their nest. This is super useful when it’s time to clean the cage, especially if you have a pet that likes to burrow. There are also different color options for you to choose from! This giant hamster cage by YML is a blast from the past. It’s the type of cage you first think of when you imagine your hamster living in one of those big cages with all of the colorful accessories and toys! The bottom can be either green or pink, but it’s translucent so you can see where your furry friend is hiding when it’s cage cleaning time. There’s an exercise ball inside the cage that they’re going to love, as well as a house for them to next in, tubes for them to run around in, and a wheel. Your hamster will be properly stimulated with this set, and you won’t have to buy any extra accessories. Everything you need is here, except food, bedding, and of course your hamster. The wires are spaced close enough together that they won’t be able to squeeze out between them and get themselves into trouble. We love this cage! This hamster tank cage is unique on our list because it fits over a glass tank in order to give your hamsters breathing room and new heights to explore. 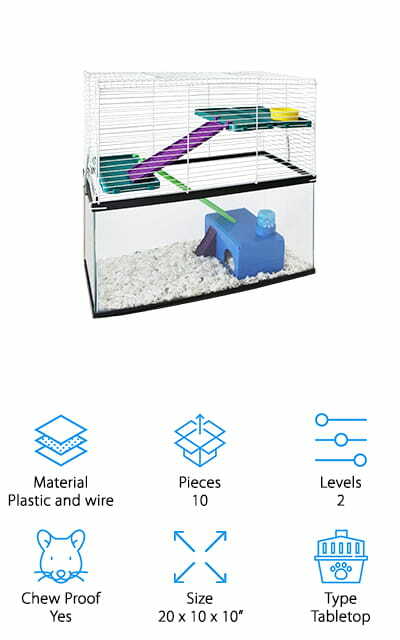 Simply place this wire structure of the glass hamster cage you already have and connect a ramp to the first level, and your furry friend will have so much more room to explore and exercise. The wire is coated so it’s chew proof, and all of the plastic parts on the interior of the tank are stain-resistant. It works as a topper for any ten-gallon tank that you’re already using for your small pets, including gerbils and mice as well. The bars are spaced at half-inch intervals so it’s easy for your pets to climb without being able to get out. We love the tank-topping design and the idea that it will double the living space your pets have. It’s a great alternative to buy a whole new habitat! 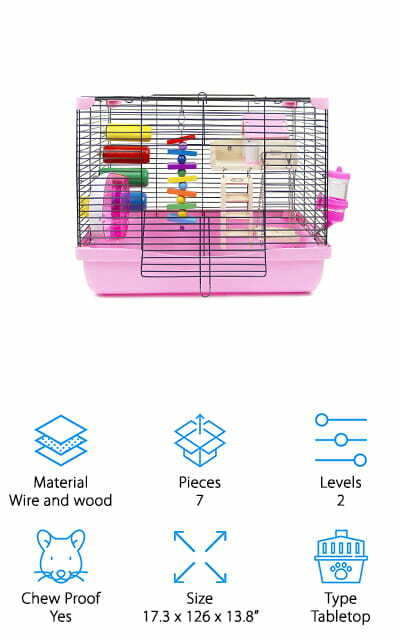 This cute pink habitat is one of the best hamster cages on our list, mostly for its inclusion of wooden toys as accessories. This cage includes a wooden platform with a great nesting house, as well as a wooden swing toy that your curious hamster is sure to love! There are a ladder and strings to chew on, as well as the traditional hamster wheel to enjoy. Your pet is going to be so entertained they won’t ever want to come out of this cage! The base is plastic for easy cleaning, and it’s a great cage for dwarf hamsters, mice, or gerbils as well as regular hamsters. You can get this set in blue or pink depending on your preference. There is a door in front and a door on the top of the cage for easy access to your hamster as well as a handle for easy carrying if you need to do that. This huge cage by GNB certainly looks like the best hamster cage ever! It’s full of tunnels and slides so that your hamster will have the time of its life. 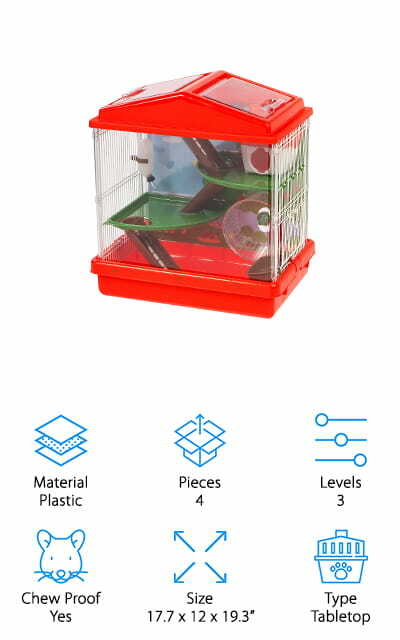 It’s a huge habit with plenty of extra parts and levels to keep you creating and your hamster entertained. It’s a small pet paradise! The tubes and tunnels are made of non-toxic plastic that won’t harm your pets at all. We love how big this place is, and how big you can make it with additional tubes and habitats. Make your small furry pets an entire world of their own to play in if you want! It’s easy to assemble and fun, while also providing everything your hamster needs. The wires are chew-proof so that your pets can’t chew their way out of the cage and get themselves hurt in other parts of your house. It’s fun for both of you and will last a long time! This three-story hamster cage is pretty amazing. It can come in four different colors, including two shades of blue, yellow, and pink. It comes with an exercise wheel, two removable platforms and two ladders that your hamsters can use to get up to them. There’s also a cozy little nesting house for your furry friends to sleep in. The cage has a door on the roof to help you get your pets out to clean the cage. It cleans quickly because the bottom of the cage is a grill. All the waste and others fall into the pull-out tray and then you only need to clean the tray out. We love that system, which makes it so much easier to maintain the habitat for your pets. You can easily access all levels of the cage fairly easily. It’s 22 inches high, perfect for all of your furry friends. We love all the accessories that come with this cage!